One of the more interesting keystones of the visual novel genre that usually flies over my head is the protagonist. If you’re a long-time reader of this site, you know that a VN protagonist can easily make or break a game for me, but they rarely succeed in what the writer usually sets out for them to do: allow me to envision myself as them. Most VN protagonist fit along a wish-fulfillment spectrum and are supposed to be just hollow enough to get the audience to imprint themselves on to them. So usually, if the audience walks away identifying as one of the characters in a VN, then the author succeeded in their goals: regardless of if the writing for said character is good or bad. I have repeatedly called this ‘narrative sleight-of-hand’ for that reason. That doesn’t mean a protagonist doesn’t come along every once in a while to capture what is left of my heart. It does mean that have to be incredibly well-written to accomplish this feat, though. To whit, I can count all the VN protagonist that fits that description on one hand: Yoshiharu Kawaru from World End Economica, Jill from VA-11 HALL-A, Kangai from the Jisei series, ….that’s all that come to mind now. These characters evoke a connection through their journey: their highs and lows going beyond audience fantasy and into real life experiences: creating a far deeper connection that what could be achieved through fantasy alone. It’s hard for even veteran fiction writers to pull these type of characters off, which is one of the reasons I’m so impressed with Jorgen, son of Knut; protagonist of Walkerman. Now, I say that knowing full well that if they do this character right, Jorgen could end up being one of the most hated EVN characters of all time. Why? Well, this is going to cause some divergence but it is necessary because a lot of Jorgen’s character can be explained through an editorial I wrote about Netflix’s The Crown titled Heavy is the Head. For those, who don’t want to click the link (HOW DARE YOU), here’s a quick refresher. Most VN protagonist exist as wish-fulfillment stand-ins. This means of all of their idealized traits the biggest, regardless of their fandom, is ’emotional liberation’. It’s the raw, unmitigated power of embracing your inner self and -siiiiiiiiiiiiiiiigh- listening to your heart (excuse me while I vomit). However that is defined depends on the target audience, but it always ends with the protagonist’s character arc is directly tied to their ability to do that heart thing I mentioned earlier. And in anime, manga and ESPECIALLY visual novels, this narrative path is quickly becoming cliche: see the ‘Defrosting the Ice Queen’ trope for more information on that. In discussing The Crown, I talked about emotional liberation’s exact opposite: emotional denial. Just like it says on the tin, it’s a character arc not defined by the protagonist listening to their heart, but rather embracing their colder, more rational side. This was the entire first season of The Crown, but is also a big narrative thread in one of my favorite television series: Fargo. ‘Good’ in Fargo is defined by strict terms and those terms are codified by the characters represent them: usually the police. These characters, and especially Lou Solverson, played brilliantly by Patrick Wilson in Season 2, define the emotional denial arc. They’re straight-forward, buttoned-up, relatively traditionalist, fundamentally decent and logical. This counters everyone else in the show whose emotions tend to spiral into bad situations and ends with someone in a wood chipper. Long story short: WATCH FARGO. So, what does all of this have to do with Jorgen? At least for the moment, Jorgen is a character defined by his faith and the suppression it leads to. Well before we dig into Jorgen any deeper, he is someone who runs directly opposite to what most current fiction holds up and, in fact, openly mocks it with his very existence. Many will already be put off by his seriousness and devotion, but then it gets kicked into a higher gear because Jorgen’s faith, and the larger cult in Midgard, is literally fascism. The Eddas, their holy scriptures, preaches that mankind was once bestial until given sentience by the Matriarchal Trio: the goddesses of their realm. Midgard was put above this races partially because their race was simply better, partially because the raiders of Midgard did everything they could to deny themselves. The Social Constructs they live by governs their behavior, down to ensuring they never eat alone so that they don’t put their own appetite ahead of the group. In the entire run time of Walkerman Act 1, Jorgen is the only one we see who does his best to follow the Constructs to the letter and just as willing to deny himself as he is to look down on others. If Jorgen’s racial comments don’t send people running away from Walkerman, his refusal to eat lunch on its own because it would contradict his religious beliefs will at least get them rolling their eyes. And yet, for all the hate I know will come his way down the road, I get this guy. More importantly, I like this guy. Yes, Jorgen is a bit of a bigot and he will piss off more than a few with his inner monologues and how strictly he governs his own life. However, what I find most interesting about him though is that for all of his casual racism, what is often ignored (so far) is that the two groups of people Jorgen despises the most are the Gottlanders who started Midgard’s decline and his fellow raiders who haven’t done anything to STOP Midgard’s decline. He loathes his people about as much as he loves them and wants to do his part in saving it from itself. He has no intentions or desire to overthrow the state religion or government, but he wants to play whatever part he can in reminding the people of what they were. This is why Jorgen chose to be a walkerman. Yes, the profession is hated and there is a sure chance he’ll die doing this job. However, it’s also the only social institution in Midgard untouched by its cultural decay. The Walkermen are the last of Midgard’s pride and they quietly reminds everyone who sees their pouches that life is meant for more than today’s pleasures. Life is service. Life is sacrifice. Life is death and what better way to die in Midgard than in service to your fellow countrymen? Ensuring that they can go on about their day safe from the unknown threats around them? To be fair, the game never outright says this is the reason Jorgen joined. But when pressed on it, he’ll compare it more to a spiritual calling more than any sense of adventure or familial connection. This makes sense because the longer the game goes, the more you realize all he really wants at the end of the day is to earn his place and be apart of something bigger than himself. And if he’s the last man holding on to the faith in a world, by his standards, gone feral; so be it. Even if you disagree with HOW his emotional denial manifests itself, I have a hard time not believing no one who loves good fiction are so horribly disgusted by his beliefs that they don’t like where his character is and who that makes him in the larger story. Now, this is only Act 1 and I’ve already read comments salivating over his eventual turn from a devout and serious young man to something a little more carnal. Even some of the characters (like the girl in the screenshot) in the story clearly want a chance to knock Jorgen off his pedestal. However, while I joke about this during the livestreams whenever we come across the absolute goddess that is Sigrid, Scalemail doesn’t promote any romantic side to this game. It does mention sexual content, but it’s apart of the content warning: which means if it is used down the line, it may have more to do with one of Jorgen’s hunts than anything Jorgen himself does. In fact, there is already some softening of Jorgen’s edges as he is more willing to respect foreigners than his fellow raiders: despite not fully dropping the racial slurs. Yes, I could still be wrong here but there is a chance here that Jorgen never fully breaks from his beliefs: instead moderating them to be more accepting to the various people he meets without chasing whatever skirt comes his way and dropping his beliefs in order to get laid. In that case, what we see now is what we’re going to get – Jorgen, son of Knut: the walkerman and all the complexities and callouses that come with him. And that, more than anything else that Walkerman does right, puts a smile on my face. I will be reviewing Walkerman Act 1 in the near future, but I do not think you should wait for me. Pick this game up now and experience what could be one of the best written EVN protagonists to date. Yes, I said it and I mean it. 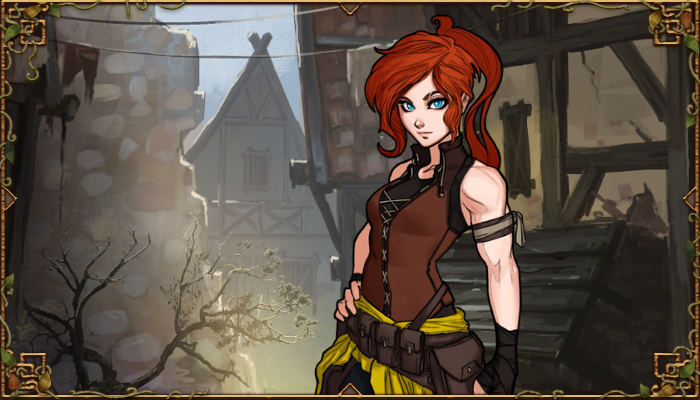 And if you’ve played the game, what do you think of the protagonist? I’d love to read your comments. JP3: OUT.